Achieve Laundry Detergent is more than just an environmentally-friendly cleaning product. The mission of this detergent is to provide meaningful employment opportunities for individuals with developmental disabilities and 100% of the proceeds go toward accomplishing that goal. Despite their eagerness to work, diverse talents, and infectiously positive attitudes, people with developmental disabilities have one of the highest unemployment rates of any demographic. Achieve is working to solve that problem one load of laundry at a time! The mission and purpose of this organization is to provide employment training and business experience for adults with developmental disabilities. These activities and experiences teach the organization’s clients transferable life and vocational skills which enhance self-confidence and self-esteem, and foster independence. Wash with a Cause and Support Ambassadors for Business! 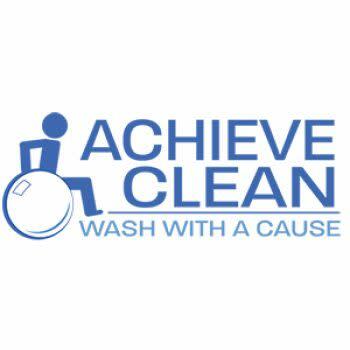 One hundred percent of the proceeds from Achieve Laundry Detergent are invested directly back into programs that create jobs for people with developmental disabilities. AND... $3 per bottle sold is donated to Ambassadors for Business! AFB will arrange to have a supply of Achieve Clean at all of the Big Events and many of the open networking events so you can pick up your bottles and avoid shipping.